This chapter reports research in the City of Leicester between autumn 2013 and spring 2015. It explores changing approaches to austerity governance at the city level and in a sub-case, the governance of housing and homelessness. It argues that the dominant characteristic of austerity governance in Leicester is captured by the term “austerian realism”. This term refers to the disposition within the Labour-led authority of regretful austerity compliance, nonetheless pursued with diligence for the perceived lack of a viable alternative. We find that collaborative institutions and practices in Leicester are strongly influenced by the tropes of austerian realism. Changes and innovations in collaboration are therefore best understood as vehicles for delivering public sector retrenchment. The paper highlights inter-related explanations for the dominance of austerian realism in the governance of Leicester: First, it comments on the “dependency culture” in UK local government, fostered by enduring centralist tendencies in national government. 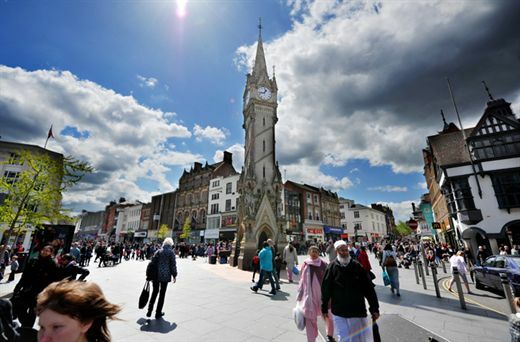 In Leicester, local political leaders believe they have no alternative but to deliver austerity and seek to deflect blame upwards to the UK government. This perspective also reflects the dominance of neoliberal orthodoxy throughout British politics nationally, reflected in the stance of the Labour Party, arguing for a lighter form of austerity rather than outright refusal. Second, we focus on the tacit hegemony of austerian politics in Leicester’s civil society, articulated through voluntary sector pragmatism and the relative weakness and flux of small protest movements. In this sense, Leicester is a microcosm of the national picture, where – outside Scotland – the anti-austerity momentum of Spring 2011 has never been recovered, and a popular socialist party (like Syriza) capable of articulating, channelling and building anti-austerity sentiment, has yet to emerge.